On 30 January 2019, Kazushige Endo, Director of UNCRD, delivered a lecture entitled, "Activities of UNCRD and Sustainable Development Goals (SDGs)" at the Training Workshop on "Climate Change Strategy for Local Government: Local Carbon Society Policy Development and Implementation" organized by the Ministry of the Environment Government of Japan and the Institute for Global Environmental Strategies (IGES). 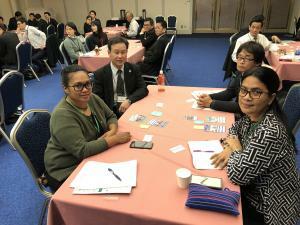 The training workshop was attended by environmental policymakers from five local governments in Southeast Asia and Oceania and five local governments in Japan. Director Endo's lecture was delivered at the beginning of the session during which participants played the "2030 SDGs Game". The lecture was about activities of UNCRD, and was also designed with aim of enabling participants to gain a better understanding of UN principles and initiatives on SDGs. For Director Endo's presentation, please visit here.